Maurice River Township is located in Cumberland County, South Jersey. 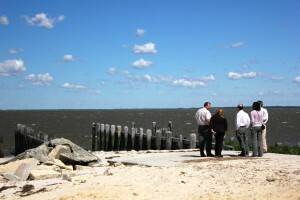 Portions of Atlantic and Cape May Counties lie to the east, the Delaware Bay lies directly to the south and, as it’s name suggests, the Maurice River forms the Township’s westerly border. The Township is 94.7 square miles and in 2010 its population, which has been declining over the past 30 years, was 7,976 persons. This number is misleading however because over 55% are inmates in the two state prisons that are located within the Township. With only 84 people/sq. mile the Township is clearly sparsely settled, particularly in comparison to state’s population density of 965 people/sq. mile. The Township contains portions of four designated Wild and Scenic rivers: the Maurice River, the Manumuskin River, the Menantico, and Muskee Creeks. The Manumuskin River, home to over thirty-two rare plants, is considered one of the most botanically significant areas in State. More than half of New Jersey’s 25 threatened and endangered bird species breed within the municipality. According to the Township’s CPAP application, over 50% of the municipality’s total land area is either State-owned, in a conservation program or publicly owned. Additionally, large tracts of land are owned by a few mining companies that are actively involved in extracting the Township’s extensive sand and gravel resources. Less than 2% of the land area is used for non-residential purposes and only 9% is residential. Furthermore, to a large extent, whatever development activity does occur in Maurice River must conform to requirements set not by the Township but by state agencies. 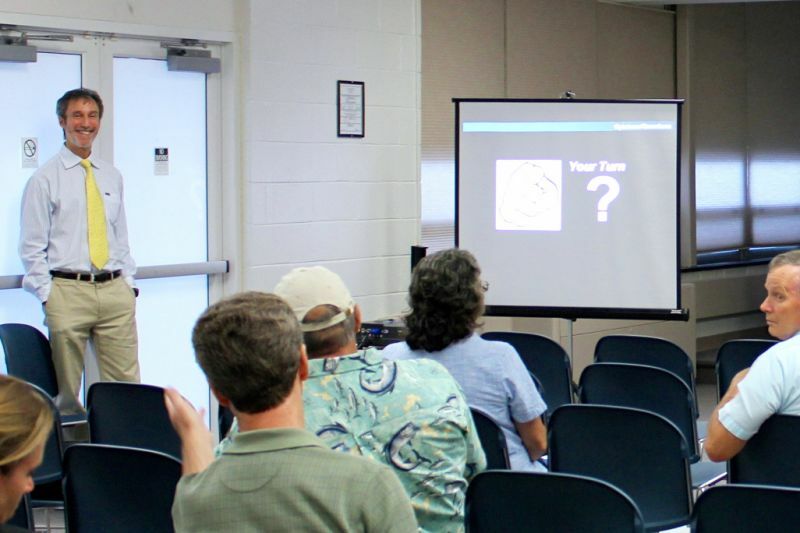 Approximately 72% of the Township is located within the Pinelands National Preserve and thus governed by the Pinelands Commission’s Comprehensive Management Plan. 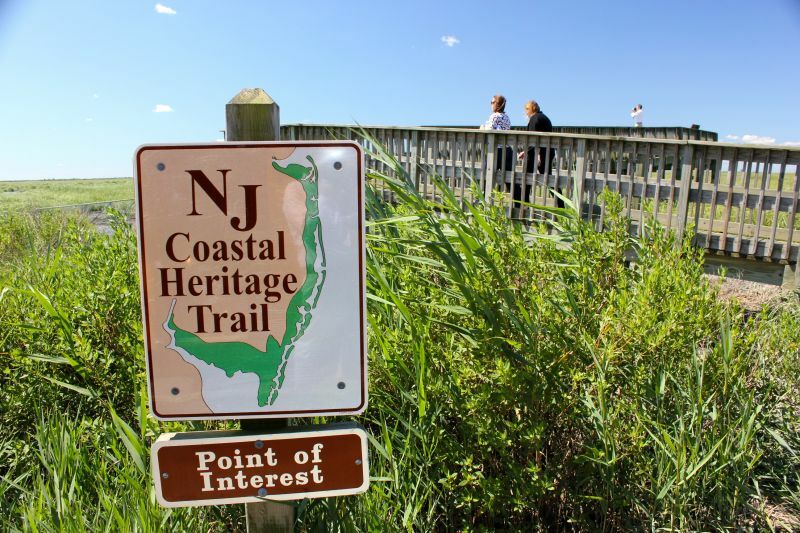 Of the remainder, 20% is within the New Jersey Department of Environmental Protection’s Coast Area Facilities Review Act (CAFRA) boundaries, leaving only 8% subject to locally determined land use control. 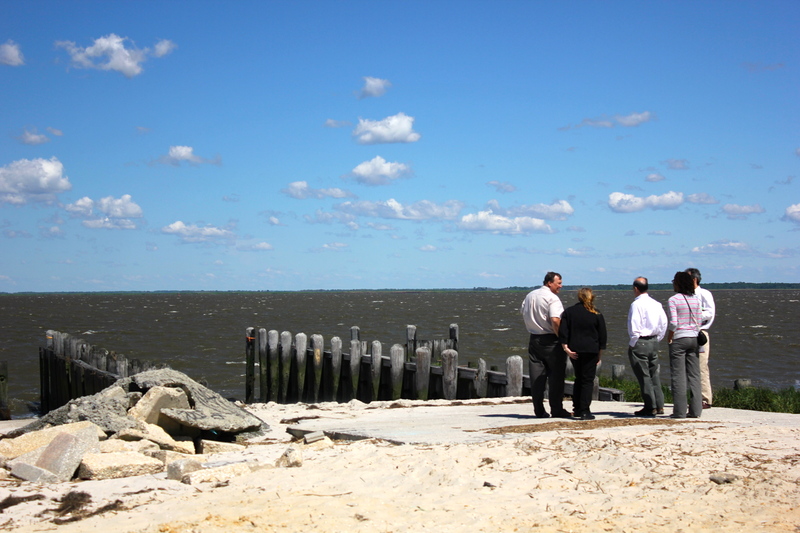 The Township is located on one of the main shore-bound travel routes between Cape May County and Philadelphia. At one time, traffic entered the Township on Route 55 and then headed along Route 47 – which ran through the Township’s village areas – and then to Cape May County. In the 1990s, in order to relieve high levels of seasonal congestion, the state constructed Route 347, which successfully diverted traffic from the portion of Route 47 running through the Township. However, in the view of Township officials, the unintended negative consequence of the by-pass was the closure of the few businesses and farm stands that depended on Route 47 corridor activity. Prior to conducting the Maurice River Township CPAP workshop the Planning Team conducted background research to become familiar with the characteristics of the municipality. A detailed GIS assessment was performed and a base map series was created to illustrate: regional location; current aerial photography; road network; parcel data (MOD IV-PEMS); zoning; parks/trails/public access points; open space (public, private, county, state); land use/land cover; natural features; T&E; historic properties; and, state agency jurisdictional boundaries. An economic base analysis was prepared to evaluate the area economy’s competitive strengths and weaknesses. An environmental opportunities and constraints assessment and a preliminary municipal public access plan were prepared. Various reports and plans either underway or previously prepared by the Township, Cumberland County and the Pinelands Commission were reviewed. Interviews with key stakeholders were conducted and a pre-workshop meeting and tour was conducted with the Township’s Mayor and consulting planner. 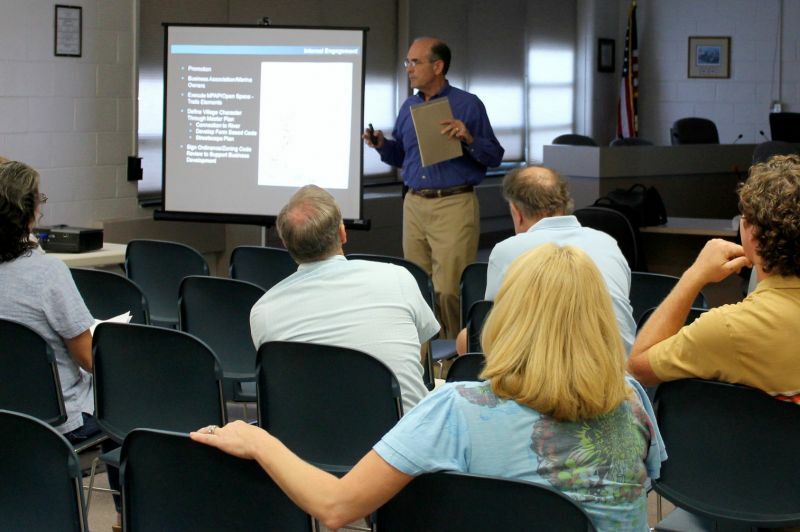 As a public participation experiment and a technique to involve residents of the Township who might not ordinarily provide input to a planning process, the Planning Team developed a web-based, open public survey using IdeaScale (http://ideascale.com/). This social networking tool not only enables participants to respond to a set of interview questions but also permits respondents to submit their own ideas about various topics of interest. The site logs responses and tracks trending ideas and was designed to periodically update team members on the status of input received. Although the web site was only active for a few weeks prior to the workshop it received a surprisingly high number of hits that expanded the Team’s understanding of residents’ interests and concerns, thus demonstrating the value of this tool for planning purposes. The CPAP workshop was designed as a two-day intensive work session. During the first day the planning team toured the municipality and attempted to characterize the critical issues facing the Township. In the evening of the first day the team conducted a public meeting to review and seek verification of its conclusions from the Township’s residents, elected and appointed officials. On day two of the workshop, the team was tasked with devising strategies the Township should consider to respond to the identified issues. These recommendations were presented in a second public meeting on the evening of day 2. 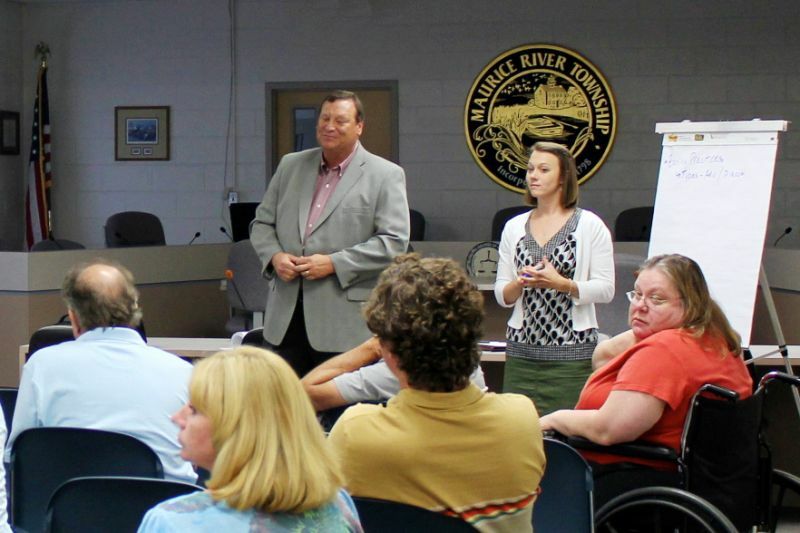 Although the principal intent of CPAP is to provide municipalities and CBOs with planning services they might not otherwise have access to, the reality in Maurice River is that over at least the past decade the Township has engaged in numerous efforts to strengthen it’s local economy and promote it’s natural amenities, although with limited success. To this extent, Maurice River Township may be atypical to the model on which CPAP is designed to work. 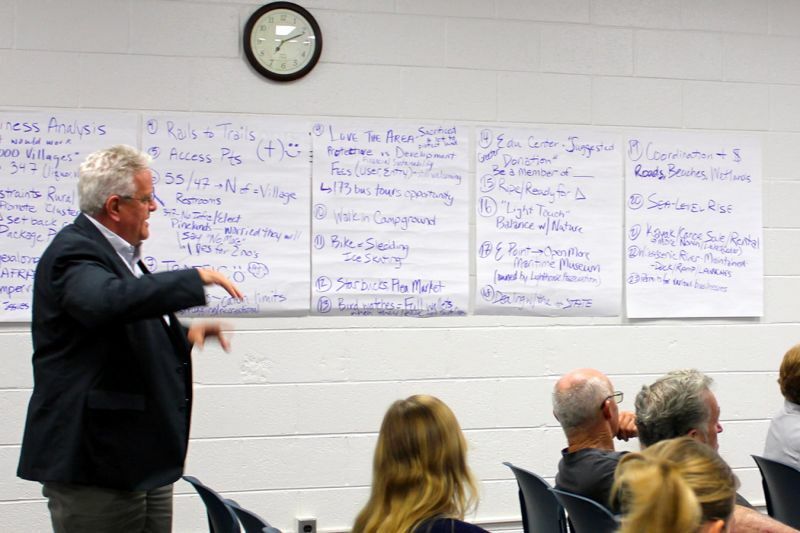 Based on interviews, responses to the web survey and the public input sessions during the workshop, it became evident that the Township does not anticipate, nor does it necessarily desire a large influx of either residential or commercial development. Workshop participants and interviewees expressed an interest in attracting development that would fit the “small-town” atmosphere of its villages, reestablish lost businesses and promote natural areas through eco-tourism. After all, Maurice River’s rural character is one of the principal reasons that people who live in the municipality, many for their entire lives, value the Township. The residents of the Township don’t want development that would adversely alter that character. 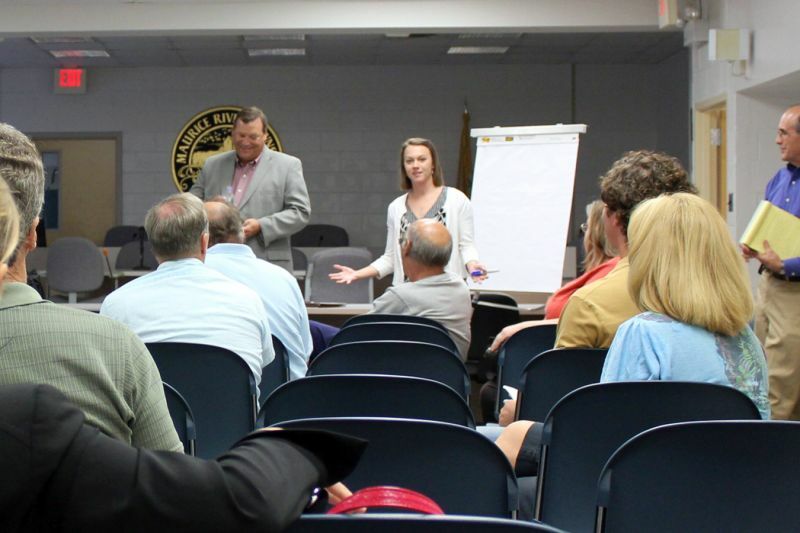 Develop a self-promotion strategy – perhaps working with interns from Rowan University or Cumberland County Community College communications programs to improve the Township website and provide visibility on other social networking sites.